SCV Commercial 6-29-15 from Mike Landree on Vimeo. Our next meeting will be held at Anna’s Italian Restaurant, 7009 Mechanicsville Tpke, Mechanicsville, Va. on July 1st. We will meet for dinner at 6:00 pm. The meeting will begin at 7:00 pm. 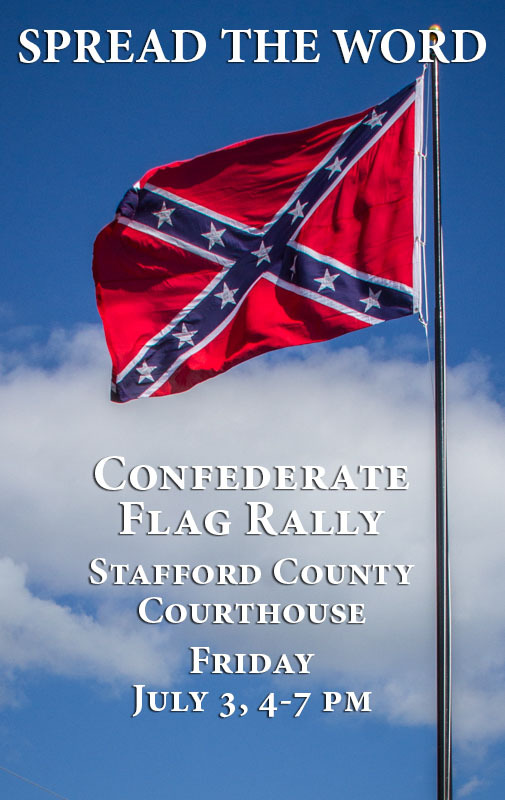 Please see the last issue of Confederate Veteran for the Proposed Constitutional Amendments that we will be voting on. Our delegates will cast the Camps’ vote at the 120th National Reunion. Also we will discuss the Virginia Division Executive Councils resolution. This should be a very interesting meeting. Heath Lee our July speaker has had to cancel and Susan Hathaway has graciously agreed to speak. Heath Lee’s presentation has been rescheduled for January. 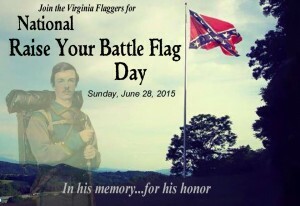 Please consider bringing a friend who might be interested in joining the fight for our Southern Heritage. Friday July 3, 4-7 pm. 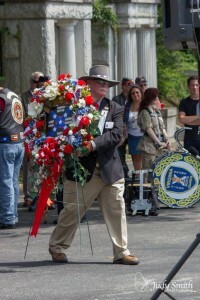 Commander Creech and other camp members attended the Point Lookout Memorial Service this morning. The June Edition of The First Shot is now available for download. The Elliott Grays, Chapter 1877, UDC and the ERFE Camp 3000 SCV Tombstone and Iron Cross Dedication at Hollywood Cemetery. June 21,2015. 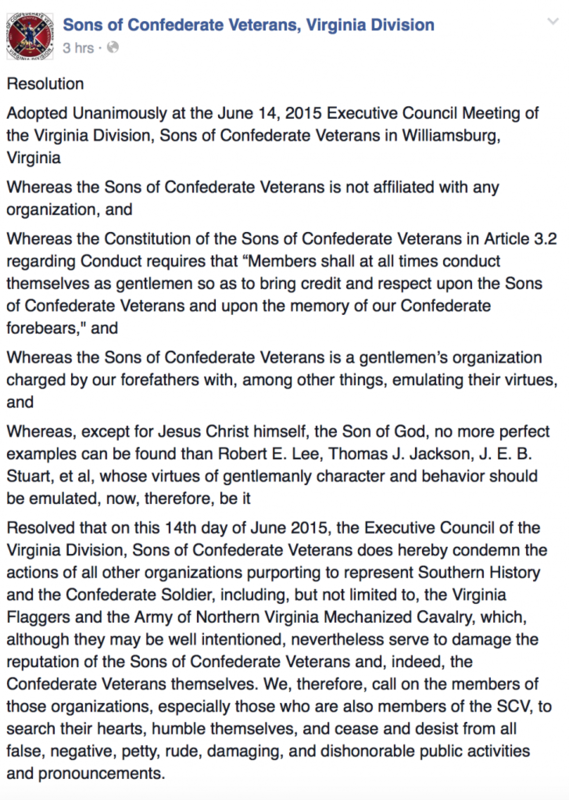 Resolved that on this 14th day of June 2015, the Executive Council of the Virginia Division, Sons of Confederate Veterans does hereby condemn the actions of all other organizations purporting to represent Southern History and the Confederate Soldier, including, but not limited to, the Virginia Flaggers and the Army of Northern Virginia Mechanized Cavalry, which, although they may be well intentioned, nevertheless serve to damage the reputation of the Sons of Confederate Veterans and, indeed, the Confederate Veterans themselves. We, therefore, call on the members of those organizations, especially those who are also members of the SCV, to search their hearts, humble themselves, and cease and desist from all false, negative, petty, rude, damaging, and dishonorable public activities and pronouncements. 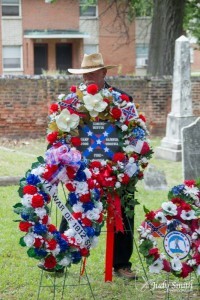 On June 21 at 10 AM, Hollywood Cemetery, there will be a grave marking for Pvt. 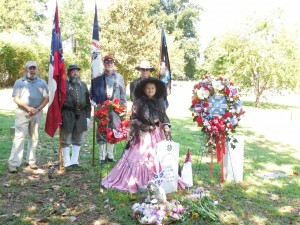 G. W. Carter, 42nd VA Infantry. 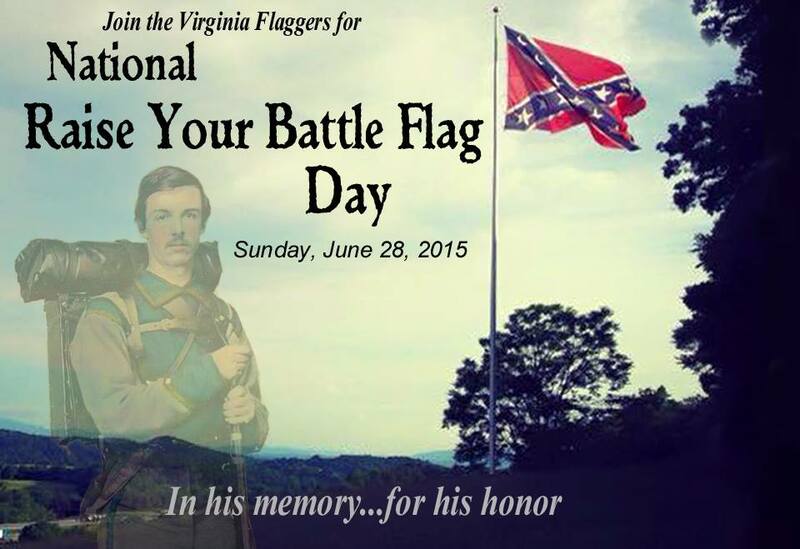 Our very own Edmund Ruffin Fire Eaters Color Guard will be serving as the color guard for the event. Anyone interest in participating please contact our Color Guard Commander, Joe Wright as soon as possible. Compatriot Jim Tingle once again represented the Fire Eaters by laying a wreath at the Shockoe Hill Cemetery Marker Dedication. 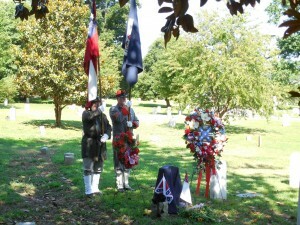 Also participating in the ceremony were Compatriots Brandon White and Michael Bouganim. Following a moving speech by the Rev. 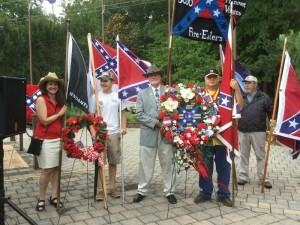 Herman White, Compatriot Jim Tingle presented the Edmund Ruffin Fire Eaters camp wreath at this years service. 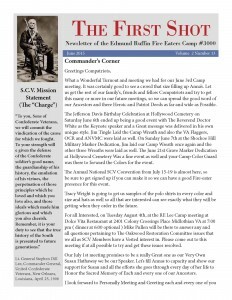 The Edmund Ruffin Fire Eater Camp # 3000 requested the following documentation at the Virginia Division Convention on April 18th, 2015. 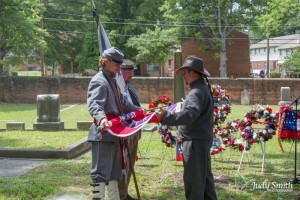 A copy of the July 2012 detailed plan for Oakwood Confederate Cemetery. 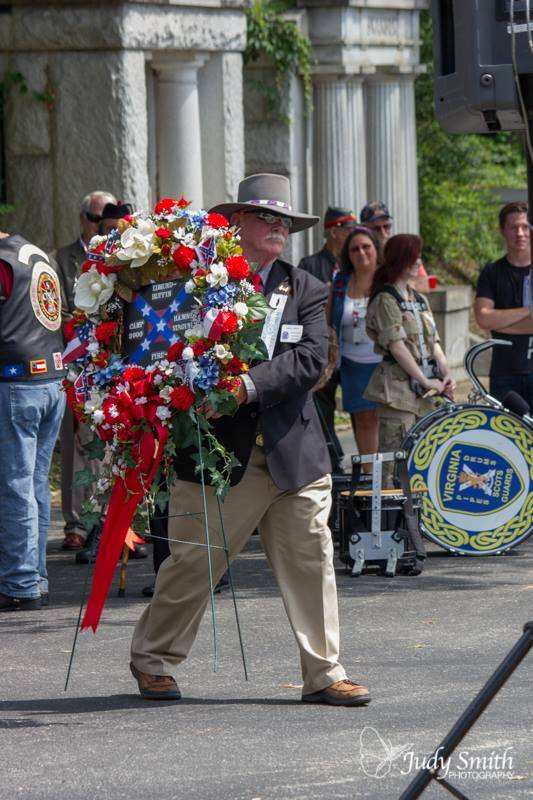 A copy or posting of the grave designations and confirmed names to be supplied to the Veterans Administration. 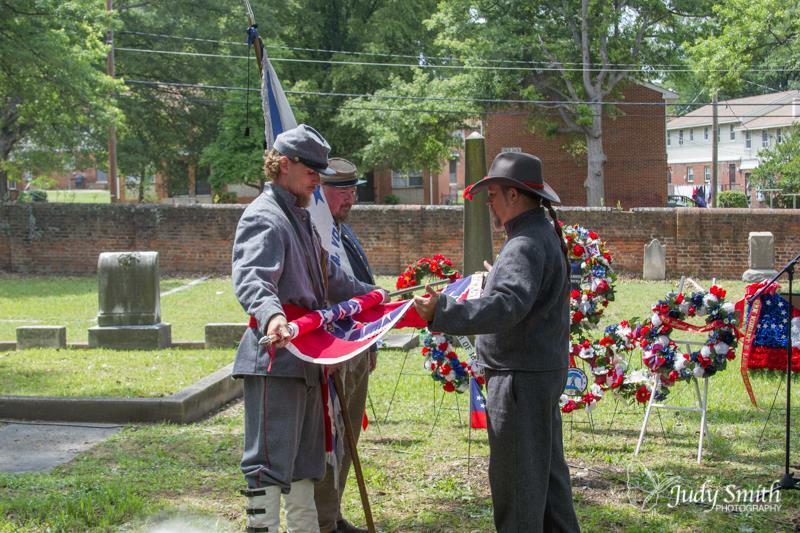 A copy of the agreement with the City of Richmond to continue the maintenance of the Confederate Section in Oakwood Cemetery. Tracy Clary would not make a decision and stated the Oakwood Restoration Committee and the Division Executive Committee would take the matter under advisement. Six weeks later we continue to wait for documents that should be available to all members of the Sons of Confederate Veterans. Without accountability and transparency from the leadership of the Virginia Division and its committees, there is an appearance of deceit. Please act honorably and release the documents you use as justification for not allowing trash pickup, pruning branches that have overgrown our ancestors graves and rebuilding a City owned gate with SCV monies. We are looking forward to seeing everyone in July. The newsletter for the Capt. 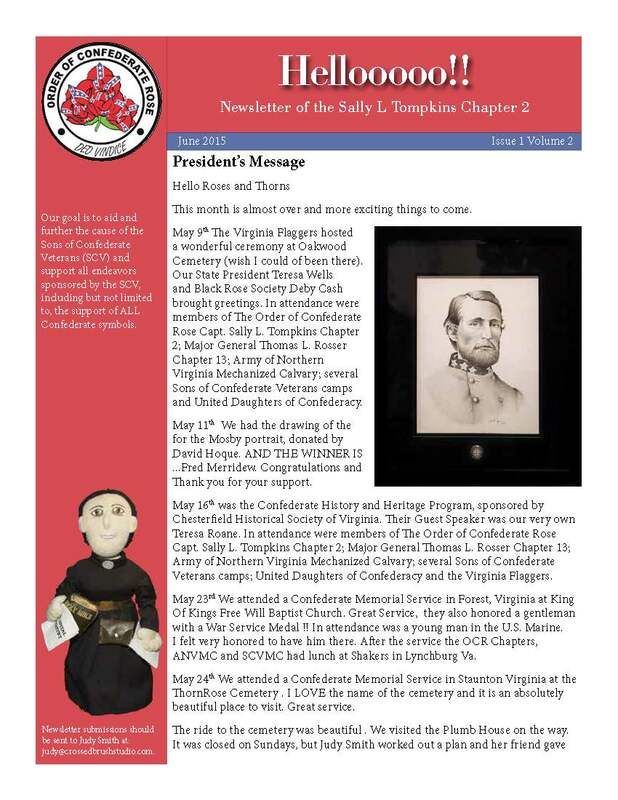 Sally L. Tompkins OCR Chapter #2 is available for download. Please click on the image to get your copy.